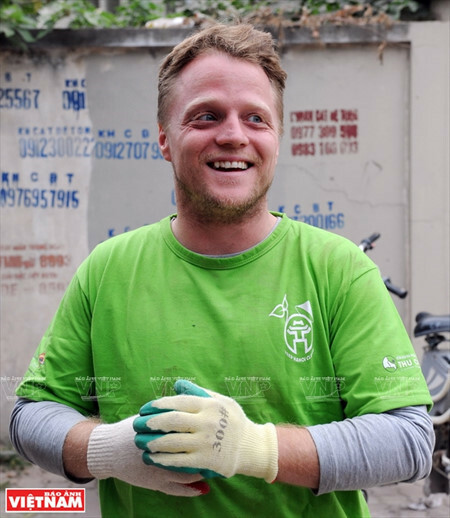 James Joseph Kendall, an American English teacher at an elementary school in Hanoi, became famous by chance after he retrieved trash from a polluted ditch in Hanoi, in May 2015. He and members of “Keep Hanoi Clean”, a volunteer environmental group he founded, have been devoting themselves to projects to clean Hanoi. Despite limited budget and experience, James and his “Keep Hanoi Clean” volunteers have managed to do lots of admirable things. About 200 tons of trash have been collected at parks and lakes around the city. Group members have raised residents’ awareness not to re-litter the cleaned areas. Every weekend, a walk organized by “Keep Hanoi Clean” to gather rubbish attracts about 50 volunteers of various different ages, careers, and nationalities. Phan Thi Hang, who by chance saw some “Keep Hanoi Clean” volunteers picking up rubbish at Nghia Do Park in Cau Giay district, decided to join the group without hesitation. “I find this activity more practical and has greater impact than any communications campaigns. It’s a good way of education as both adults and children can take part, and the program is conducted in public places. I’ll try to join every week,” Hang elaborates. “They have cleaned up the park. I’m glad that they are helping to relieve our burden,” said Nguyen Thuy Ha, a city cleaner who works at Nghia Do Park. In response to this year’s Earth Hour Campaign, James and his group have planned to launch environment-friendly lanterns during Earth Hour, clean up the whole city, and organize a parade for the environment. James says anyone can join and he hopes many people will respond to the event. He plans to expand operations of “Keep Hanoi Clean” nationwide and is realizing one of his projects to create dust bins with a friendly, eye-catching design to put at schools and then across Hanoi. “Everybody can protect the environment. It's not just me. It's not just any environmental group. And it's not too late. Just because something looks really bad doesn't mean it's impossible. When I think about the fish in Vietnam, I think about the fish in the world. I think that it's something people in Vietnam and in the world should think about. It's the future of the planet, about our children' future. It's not easy to find solution for any problem. This isn't easy but it has to be done,” James said.